In 1908, two years after the opening of Piccadilly Circus tube station, the first electrical advertisements appeared, on the façade of the London Pavilion with Perrier being the first brand to be illuminated. Then, in 1923, electric billboards were set up. Theses early signs used incandescent light bulbs which were replaced with neon lights as well as moving signs. The very first neon sign was for Bovril. Coca-Cola began advertising here, in 1955, with Sanyo taking up residence in 1978 and McDonald's joining the club in the 1980s. In 1984 Sanyo took its second sign, which was the oldest of the existing signs and has remained unchanged ever since. It was the only sign left that used neon. TDK replaced the space formerly occupied by Kodak, in 1990, while, in 1994, Samsung took the sign previously taken by Panasonic, which had replaced Canon. During the 2000s there was a gradual move to change the signs to LED displays. 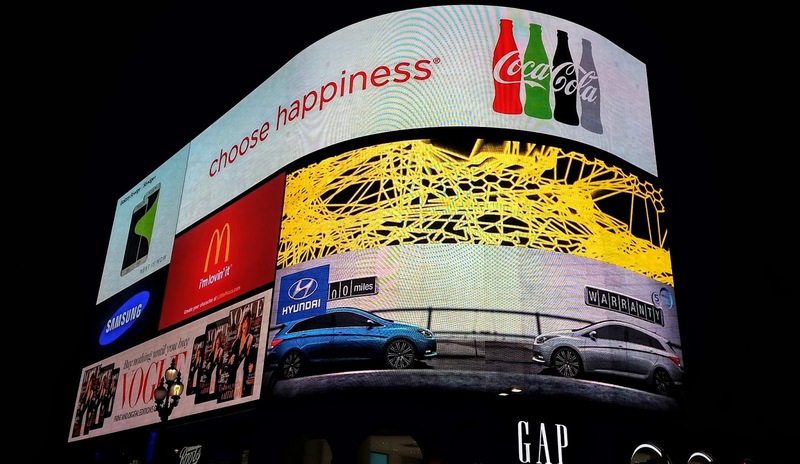 Hyundai took over one of the five permanent signs, in 2011, from Sanyo, marking the first time since 1994 that one of the signs had changed advertisers.